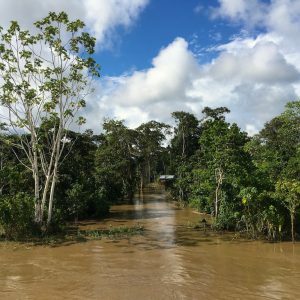 If you are wondering how to get out of the jungle, there are only two ways: by boat or by plane. 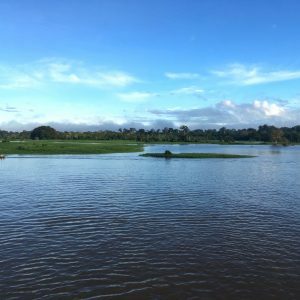 I decided to go by boat from Leticia to Iquitos and take the chance to see more of the Amazonas. 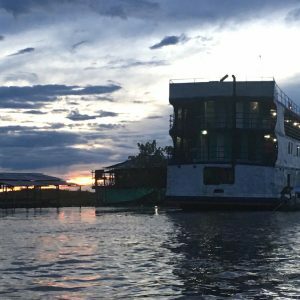 This article is about my experience on the boat, and will help you plan and prepare for this boat trip. 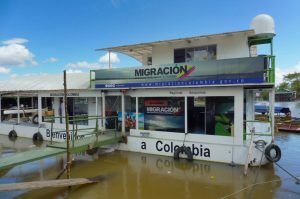 First, you have to decide if you want to take the speed boat or the slow boat to Iquitos, and second you have to make sure to get an exit stamp in Colombia and an entry stamp in Peru before you get on board. So let’s go through it step by step. 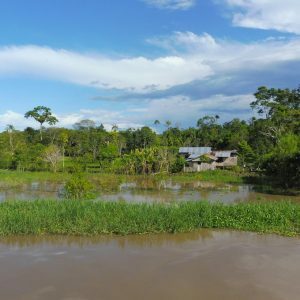 Note: As I wanted the full Amazonas experience, I decided to take the slow boat, so this article is more focused on the slow boat. The speed boat takes around 12 hours, a ticket is 160.000 COP (45€) and includes lunch. Boats are leaving every morning at 4 am (except Monday). You can book the ticket with tour agencies or you can buy it directly from the boat companies, named Golfinho and Transtur. 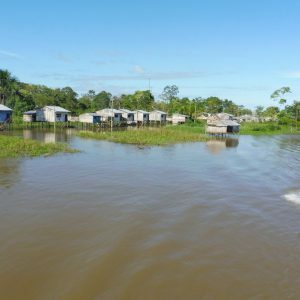 To get the tickets directly form a boat operator, you have to go to Tabatinga (Brazil). To cross the border is easy, because there is no border control and if you don’t take a closer look you won’t even realize that you even cross the border. The slow boat takes around 2-3 days and is cheaper, a ticket is 80.000 COP (22€) and includes 3 meals a day. 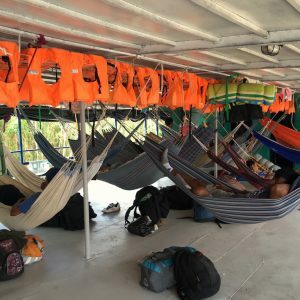 As this is a Cargo Boat, there are no cabins, you sleep in a hammock next to other people in a common area. The locals are also using these boats, as they are stopping in the villages along the way. The boat is leaving every night at 8 pm (except Thursday). 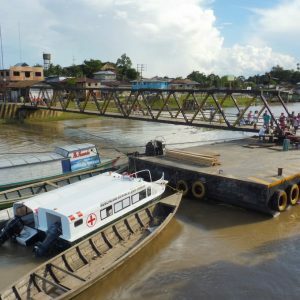 Both boats are leaving from Santa Rosa (Peru), which is on the opposite side of the river from Leticia or a platform in the river close to the town. You get there by taking a small boat from Leticia. There are boat men waiting along the pier and they bring you to Santa Rosa any time. The ride takes 10 minutes, and costs only a few COPs, depending on how many people are getting on the boat you can split the price. 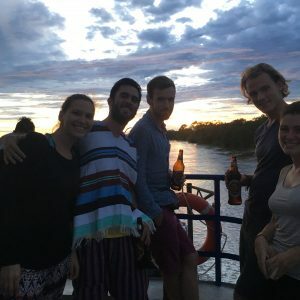 Please note, as boat schedules can change and are not that reliable, make sure to ask in the hostel or people in the port of Leticia when the boats are actually leaving in the next days! Make sure you get both stamps within one day, otherwise, you could have an issue with the immigration offices. First you need an exit stamp of Columbia, otherwise you won’t get an entry stamp in Peru (sounds reasonable, right?). In the port of Leticia there is an immigration office with a big sign on it, so you can’t miss it. Don’t forget to check their office hours and take holidays into account. Just go to the counter and ask for an exit stamp – that’s it. 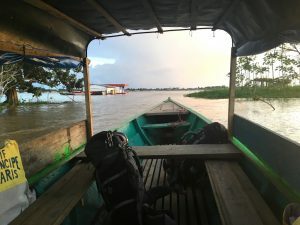 Then you take a small boat to Santa Rosa (Peru). This town is very small and the immigration office is just along the river where the boat men are dropping you off. Take into account that you could wait for a while before getting the stamp. I had to wait for 1,5 hours and they were almost closing (7 pm). They will give you a little sheet that you should keep and show when you leave Peru. 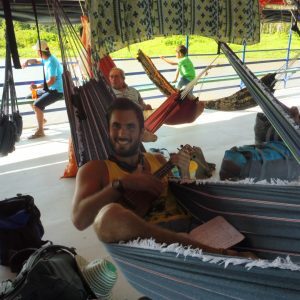 I lost this sheet and had to pay 30 USD when I wanted to fly out of Peru – so make sure you don’t lose it! It is no problem to go back to Leticia, even though you officially left the country and have a Peruvian stamp now. Depending on the time your boat is leaving, you need to move between these two towns / countries. When I wanted to leave Leticia, I had my stamps, went with all my stuff to the port, ready to board. But on that evening – I don’t know why – spontaneously no boat was leaving. So I had to go back to the hostel and stay there for another night. Officially I was illegally in Columbia, but no one is controlling it and they know that time tables of the boat are not that reliable. What do you need for the slow boat ride? If you take the speed boat, there is not that much to organize, because you won’t spend that much time on the boat. I took the slow boat, so the following recommendations are for a slow boat ride. Food: In general, don’t worry too much about food and drinks, you get 3 meals a day (they are basic but good) and you can buy basic stuff (like water, drinks, snacks ect.) for a reasonable price on the boat. 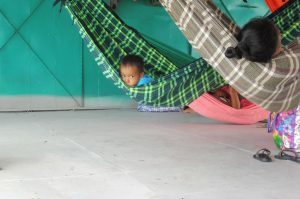 Hammock: You have to bring your own hammock. You can find it cheap on the market in Leticia, I paid around 40.000 COP (12€). Make sure, that you also buy the rope to fix the hammock on board. 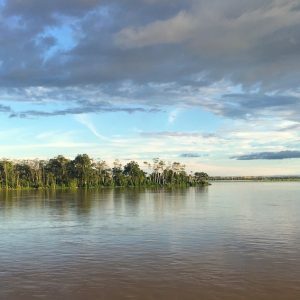 Of course, there is no Wifi on the boat, so this is a great opportunity to just enjoy the Amazonas and disconnect from the world. But 3 days on a boat might get boring after a while so make sure you take eg. a book with you. Charge all your electronic devices in advance if you want to use them (camera!) or bring a portable charger with you. I bought a mosquito spray and sun protection, because I thought that I would really need it. Surprisingly, in 3 days on the river I didn’t have any mosquitos around me. The only “negative” thing was the hygiene on the boat. There is a little room with a toilet and basin to wash yourself. There is a hose that brings the (brown) water from the river into the washing room for washing. 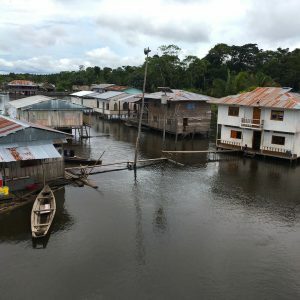 I confess that I didn’t take one of these showers – I washed my teeth, face and most important parts with drinking water and took a shower when I arrived in Iquitos. No worries, you don’t really move on the boat, so you don’t sweat that much, so for me it was totally fine like this. What to do in 3 days on board? Seriously, just relax and soak in this unique environment. 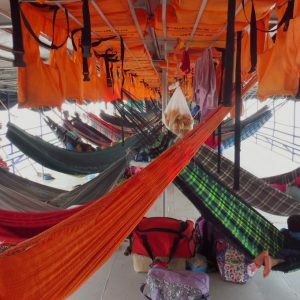 When you get on deck, choose a space you like, fix your hammock and voilá that’s your home for the next 3 days. 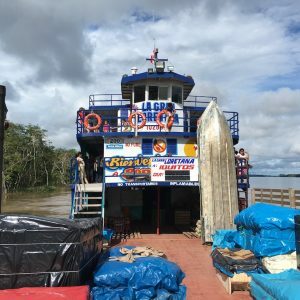 Special Tip: There are two floors on the boat, I recommend staying on the upper deck, as the lower deck can get quite loud when they (un)load the goods in the villages. And you have an amazing view on the upper deck, as it is open! At night, they cover the open space with tarps, so it is not cold or windy. I really enjoyed the time on the boat and – differently than expected – I didn’t felt bored at all. I was watching the scenery along the boat, the beautiful rain forest and I could even spot pink dolphins. The boat is stopping in the villages along the river, so I was able to see the villages from the boat and watch the hustle for a while. Seeing the sunrise and sunset on the boat, was really something special, as the sky in this area is always very dramatic. As locals are also taking these boats, take your change to chat with them a little bit. 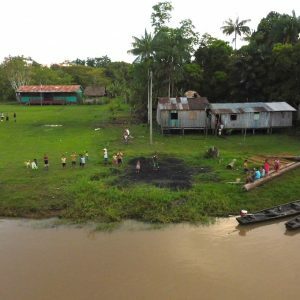 My Spanish skills are very little, but still it was possible to communicate with the locals and listen to their stories of their lives in the Amazonas. 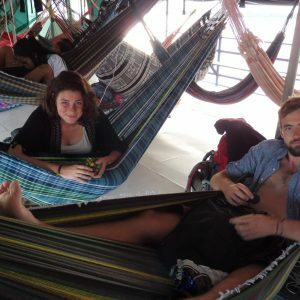 The rest of the time I spent chatting with the four other backpackers on the boat, reading, writing, chilling and sleeping in my hammock. It was a very relaxed atmosphere on the boat and I never felt unwell or unsafe. This ride was a totally special experience and I would really recommend doing it!